Annotation: Reinforce your child's third-grade language skills with Spectrum Vocabulary. 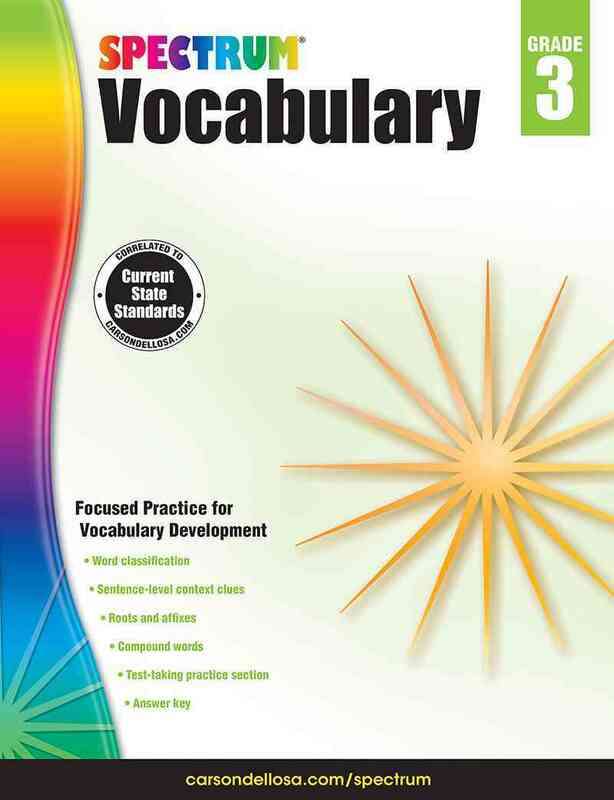 With the progressive lessons in this workbook, your child will learn words through strategies related to word classification, root and base words, and prefixes and suffixes. Spectrum(R) Vocabulary helps your child systematically build and strengthen vocabulary and comprehension skills. Students in grades 3–6 will find lessons and practice in word classification, context clues, root and base words, prefixes and suffixes, and imported words. Each workbook also includes test-taking practice sections and an answer key. Aligned to current state standards, Spectrum is your child's path to a strong and expanding vocabulary. Spectrum, the best-selling workbook series, is proud to provide quality educational materials that support your students' learning achievement and success.